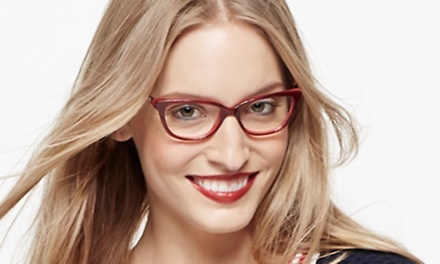 See the list of designer frames for men, women, and kids. Limit 1/person, 1 as a gift. Valid only for option purchased. Valid in-store only. Not valid for sale items. Appointment required; subject to availability. Not valid with insurance. Valid only for prescription eyewear. Excludes old lenses and previous orders. Not valid for contact lens purchases or eye exams. Not valid with other promotions or discounts. Minimum purchase of the full offer value required. Non-transferable. Must purchase complete pair of glasses. Additional charge may be applied for strong Rx.